Infrastructure must be maintained and expanded over time to fit the growing needs of the country. As the population grows and economic opportunities increase, so does the reliance on the infrastructure that supports this growth. For example, roads and bridges are needed to transport freight across the country to populations that have grown into previously undeveloped areas. Increased traffic can cause significant deterioration of county-owned roads. Facilities, such as hospitals, fire stations and schools, are also needed in these areas in response to the growth. However, new facilities require large financial investments. Counties are doing their part to respond to the demands caused by growth, including supporting 78 percent of all public transportation systems, as well as constructing water and sewer systems, and other public facilities. For counties, maintaining and building reliable infrastructure necessitates dedicated funding. However, funding from counties for projects can be challenging due to stagnant revenue pools and ever-growing state and federal mandates on services. States also limit the amount of debt counties may take on, either with or without voter approval. At the same time, construction costs continue to rise.3 Therefore, continuing the federal-state-local partnership is essential for counties to support America’s infrastructure. This report examines alternative funding solutions and strategies that counties have implemented for infrastructure projects. The analysis examines the challenges counties face in changing demographics, relationships with state and federal governments and funding these projects. Best practices from Dallas County (Texas), San Juan County (N.M.) and Montgomery County (Md. ), provide a series of takeaways for all counties regarding infrastructure funding. Several challenges exist for counties in funding and constructing infrastructure. A growing population and increased economic activity require more maintenance on existing infrastructure and new facilities in previously undeveloped areas. As counties move to build these new facilities, however, the state and federal permitting process can add to the delivery time and cost of projects. Funding these facilities is a growing challenge for counties as states restrict counties’ ability to raise revenues and limit the amount of debt they may incur, while, at the same time, construction costs increase. Growth in newly developed areas places stress on existing infrastructure and can increase the demand for additional services. Larger populations can also tax existing county buildings and facilities, such as jails and hospitals. For example, a growing population in Berkeley County, S.C. has been a factor to overcrowding in the county jail.6 Another way growth can be consequential is through the increase in response time to emergencies. The National Fire Protection Association recommends a response time of eight minutes to respond to emergency incidents.7 As the population grows and spreads, so does the need for new fire stations that can reach residents in a timely manner, along with the need to ensure roads along fire emergency routes are safe and properly maintained. The average semi-trailer truck causes as much damage to roads as 5,000 – 10,000 cars. In addition to population growth, an increase in economic opportunities – such as international trade and participation in the global supply chains – also impacts county infrastructure. According to the U.S. Bureau of Transportation Statistics (BTS), between 1997 and 2015, the total value of shipments in domestic and international trade grew by 38 percent in inflation-adjusted dollars.8 This translated to a 6.2 percent increase in freight volumes across the United States.9 The BTS further estimates that the total tonnage of freight will grow 1.4 percent per year through 2045.10 Moving this merchandise throughout the United States often requires the use of large semi-trailer trucks. However, the average semi-trailer truck causes as much damage to roads as 5,000 – 10,000 cars.11 This leads to increased maintenance of roads, with more money and time invested by the county. State limitations are making it increasingly difficult for counties to fund and finance infrastructure. During the November 2016 elections, close to $250 billion in transportation bonds were on state and local ballots throughout the country. Case Study: Montgomery County, Md. Progress Place is a county-owned facility in Montgomery County, Md. that provides a variety of services to low-income populations, including food, medical services and shelter. The facility started to experience capacity issues in the late 2000s with rising housing costs in the county affecting the demand for social services provided to homeless and low-income populations. 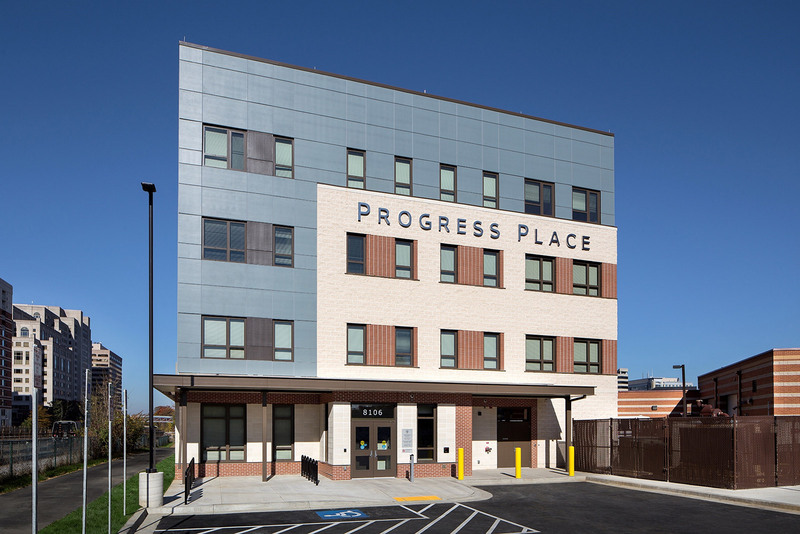 In 2010, the county opted to physically relocate Progress Place because it was in an undersized and aged building, unable to accommodate the growing number of residents accessing the services. At the same time, Montgomery County was facing increased federal and state mandates with limited funding – which made raising revenues for the expansion a difficult task. Montgomery County worked with developers to build the new facility at no additional cost to the county. Initially, Progress Place was located in an urban district with plans for mixed-use development. In November 2011, the Montgomery County Department of General Services (DGS) issued a request for an “expression of interest” to developers interested in building a new Progress Place on nearby county-owned property at little-to-no cost to the county. The location of the new building was an underutilized surface parking lot behind a county-owned fire station, meaning new land did not have to be procured. In exchange, the developer would receive the title to the plot where the previous building was located and the opportunity to develop the former site. Through the request for “expression of interest” process, the county opted to work with Washington Property Company on the expansion. The design and construction of the facility was a collaborative process between the county’s Department of General Services (DGS) and Washington Property Company (WPC). DGS was responsible for issuing the solicitation, negotiating with WPC and managing the construction process. DGS’s Division of Building Design and Construction reviewed and approved the design of the project. The county was also responsible for providing the land for the new development and redevelopment. WPC was responsible for the design, construction and cost of the new Progress Place. – Mr. Timothy Firestine, Chief Administrative Officer, Montgomery County, Md. Several positive outcomes came through the partnership between the county and WPC. Construction on the new Progress Place started in October 2015 and was completed in late 2016. In citing the success of this agreement and the construction of the now completed Progress Place, Mr. David Dise, Director, Department of General Services, Montgomery County, Md., points to the positive relationship between the county and the developer. Specifically, one benefit was the speed at which the new facility was built. Without the partnership, the build would have been dependent on the county’s capital budget, which is adopted by the County Board on a six-year cycle. However, the building was completed just four years after WPC was chosen as the builder. Additionally, the new building increased program space by 10,000 square feet, including room for 21 living quarters. Services provided at Progress Place also expanded, including laundry and shower facilities, as well as counseling, medical and vocational services. The county developed the new building without additional funding and without delay. Had a developer not entered the initial agreement, the county would have had to find funding through alternative sources, thereby delaying the construction. Instead, the county transferred the land to the developer, WPC, as payment. This allowed the developer to start construction on the new Progress Place immediately. Despite its success, the rebuilding of Progress Place was not without challenges. To inform the design, space needs and build of any county project, Montgomery County relies on a Program of Requirements — a document prepared by an architect with specific details about a build — and a design manual to specify parameters. The agreement with WPC depended on these documents; however, issues arose during the design process because the county would have been unable to require WPC to use different products or to build systems outside of what was included in the original agreement without paying additional costs for these products. The county and WPC collaborated on this issue by finding an achievable balance of what the county preferred and how the private sector completes construction projects. For future public-private partnerships, Mr. Dise states that the County will be much more likely to develop an outline specification on the scope of the project, including materials and products to use, for use by its developer partners. Dallas County, Texas, like many counties around the country, is fiscally conservative, with little debt on the books. The large county —with more than 2.6 million residents —has not issued a municipal bond package since the mid-1990s. This has not stopped the county from investing in capital improvement projects. County officials and the county’s Commissioners Court develop multi-year plans for capital improvement based on current and expected revenue, ensuring an annual balance equivalent to 10 percent of that fiscal year’s approved expenditures.32 An estimated $121 million was projected to be spent from this fund in FY2017, and $45.4 million was budgeted for FY2018.33 For all projects that include the development and construction of additions to parks, buildings or infrastructure systems, county departments submit capital needs to the Office of Budget and Evaluation. These needs are then evaluated by the Major Capital Development Committee, which makes recommendations for buildings, including a project’s costs, to the Commissioners Court. The Court then issues the order to utilize money out of the Major Capital Development Fund for a build. Since its creation, the Major Capital Development Fund has been successful in its goal of keeping debt low for Dallas County. Several projects have been completed using the fund, including a forensics facility and government center, as well as the restoration of a historic courthouse. The county used the fund to expand a jail tower at a cost of $70 million. In February 2015, Dallas County built an expansion to their large medical center within the county jail. The expansion included the addition of 135,000 square feet of space to one of the county’s detention centers, which includes both medical and mental health clinics, a dental office and two intensive care units. The expansion of the medical center cost $50 million and was paid for with cash from the Major Capital Development Fund, without the issuance of debt. Payments out of the fund were spread out across multiple project stages, including design and several years of construction. Several counties have since visited the medical facility to understand how the facility concept and design could be used within their jails. According to Mr. Darryl Martin, county administrator for Dallas County, the project was completed on schedule and within budget. As of 2017, the Major Capital Development Fund had a balance of approximately $250 million and will allow the county to be debt free by 2032. Mr. Martin states that strong fiscal management practices and a commitment from the Commissioners’ Court have placed the county in this position. Case Study: San Juan County, N.M.
Interviewee: Mr. Kim Carpenter, Ph.D., Chief Executive Officer, San Juan County, N.M.
For years, San Juan County, N.M. was home to a lucrative oil and gas industry. Tax revenues from energy producers allowed the county to pay for new facilities without raising the property tax rate or issuing bonds. However, a shift in energy production caused the county’s budget levels to decline in the late 2000s.35 At that same time, the county needed funding to build a new sheriff’s facility, which would consolidate the detectives’ units and meet the growing needs of the sheriff’s department. An expansion of the district court facility was also needed. The county commission instructed staff to find a way to issue bonds for these projects without raising the tax rate. San Juan County implemented a transfer analysis program to increase the revenue going into the general fund that would secure the payment of any newly issued municipal bonds. Under this program, the county started collecting non-general fund dollars from external agencies and county departments for services provided by general fund county departments. For example, San Juan County general fund departments provided human resources, financing and procurement services to external entities, such as the San Juan County Communications Authority and the San Juan Water Commission. The county charged these entities for the work performed and transferred those dollars into the general fund. County departments that receive non-general fund revenues have those sources charged for the services provided by the county’s general fund departments. – Mr. Kim Carpenter, Ph.D., Chief Executive Officer, San Juan County, N.M.
During the program’s first year (2009), an additional $1 million was transferred into the county’s general fund. In the same year, San Juan County issued $17 million in bonds for the new facilities. The revenue brought in through the transfer analysis program was used to pay off the annual debt service, replacing the need for additional general funding and keeping the property tax rate constant. The program brought in funds over an eight-year period in order to pay for the debt service on the new facilities. These facilities included three new courtrooms and office space for the district courthouse, a new District Attorney’s complex and an expansion of the Sheriff’s office that included training rooms, office space, detective offices, a forensics lab and evidence storage. According to Mr. Kim Carpenter, Ph.D., San Juan County’s Chief Executive Officer, the program worked because the county was transparent to stakeholders on the work rendered to them. To that end, the county performed an annual assessment on the quality of the services delivered by the county workforce. The assessments provided information on items such as journal entries posted for accounts receivable and payable and the number of requisitions and orders processed through the purchasing office. These assessments helped give external entities confidence in the quality and cost-effectiveness of the county administrative services. The transfer analysis program still exists today; however, revenues are not used to cover operational expenses. After paying off the debt service for the 2009 bonds for facility expansions, the program is now used to offset general fund expenditures. Despite the success of the transfer analysis program, Mr. Carpenter points to a few major challenges the county experienced. Some funding sources, such as revenues from the state or federal governments, restrict how dollars can be spent. Therefore, the county ensured that the funds were properly and accurately charged for the work performed. The county’s attorneys addressed this challenge by developing a thorough understanding of the usage restriction of state and federal grants. Some external partners that used county services also started having budget challenges and were reconsidering their contracts with the county. However, the county could demonstrate that these entities were saving money by having San Juan County perform some functions as opposed to these entities hiring their own administrative staff. These entities are still working with the county, and the transfer analysis program continues to bring in funds that are used to offset general fund spending. County-owned property can be used to attract interest from private entities. A partnership with these parties can facilitate the funding and construction of large infrastructure projects. No debt does not mean no capital projects. If available, dedicated funding sources can allow counties to use cash when new facilities are constructed or upgraded and frees them from issuing debt. Be willing to consider funding structures not tried before. In some situations, counties can increase revenue in the general fund through transfer programs, securing the funding for the issuance of new municipal bonds. Transfer analysis programs involve thorough understandings of county operations. Counties have adopted different funding measures, but they are not sufficient to cover the growing needs of residents and businesses. The continued county-state-federal funding partnership is essential to maintaining and improving America’s infrastructure. Counties are major providers of the infrastructure used by residents every day. Financing infrastructure by counties is an option limited by voter approval, statutorily mandated debt limits and state caps on counties’ ability to raise revenue. Counties have adopted different funding measures, but they are not sufficient to cover the growing needs of residents and businesses. The continued county-state-federal funding partnership is essential to maintaining and improving America’s infrastructure. NACo Analysis of Federal Highway Administration – National Bridge Inventory, 2016; NACo Analysis of U.S. Department of Transportation, FHWA, Highway Performance Monitoring System data, 2014. National Association of Counties, “Counties Matter” (2016), available at www.naco.org/counties-matter (January 30, 2018). Turner Construction, “Turner’s Second Quarter Building Cost Index Reflects Strong Market Conditions” (2017), available at www.turnerconstruction.com/cost-index (September 15, 2017). United States Census Bureau, “Population Estimates” (1969); United States Census Bureau, “Census Bureau Projects U.S. and World Populations on New Year’s Day” (2017). Jeff Michael, “Growth and Infrastructure,” Institute for Emerging Issues, NC State University (2010). Brodie Hart, “Berkeley County Jail Overcrowding a Growing Problem as Area’s Population Booms” ABC 4 News, November 13, 2017, available at http://abcnews4.com/news/crime-news/berkeley-county-jail-overcrowding-a-growing-problem-as-areas-population-booms (February 8, 2018). ESRI, “GIS for Fire Station Locations and Response Protocol” (2007). Bureau of Transportation Statistics, “Freight Analysis Framework” (2018). Bureau of Transportation Statistics, “Freight Facts and Figures” (2017). Zach Patton, “Too Big for the Road” Governing, July 2007, available at www.governing.com/topics/transportation-infrastructure/Too-Big-The-Road.html (February 8, 2018). Joel Griffith, Jonathan Harris and Dr. Emilia Istrate, “Doing More with Less: State Revenue Limitations and Mandates on County Finances” (Washington, D.C.: National Association of Counties, 2016). United States. Cong. House Committee on Agriculture’s Subcommittee on Conservation and Forestry. Public Hearing – Waters of the United States. March 22, 2015. 114th Cong. 1st sess. Washington: GPO, 2015 (statement of the Honorable Robert “Pete” Smeltz, Commissioner, Clinton County, Pa.). United States. Cong. Senate Committee on Homeland Security and Governmental Affairs’ Subcommittee on Regulatory Affairs and Federal Management. The Unfunded Mandates Reform Act: Opportunities for Improvement to Support State and Local Governments. February 24, 2016. 114th Cong. 2nd sess. Washington: GPO, 2016 (statement of the Honorable Bryan Desloge, Commissioner, Leon County, Fla.). Jonathan Harris, “2017 Top County Challenges across the States” (Washington, D.C.: National Association of Counties, 2017). Griffith, Harris, and Istrate, “Doing More with Less” (2016). National Association of Counties, “Counties Urge Congress to Protect Tax-Exempt Municipal Bonds” (2017). Emily Han and Ann Henebery-Phelan, “Transportation Ballot Measures Recap”, Eno Center for Transportation, December 12, 2016, available at www.enotrans.org/article/transportation-ballot-measures-recap/ (February 14, 2018). N.Y. Const. art 8, § 4. Wash. Const. art. 8, § 6. Turner Construction, “Turner’s Second Quarter Building Cost Index Reflects Strong Market Conditions,” available at www.turnerconstruction.com/cost-index (September 15, 2017). American Road and Transportation Builders Association, “2016 Transportation Construction Market Forecast and Surface Transportation Reauthorization Update,” available at www.artba.org/wp-content/ uploads/2015/12/2016_Forecast_Webinar_Slides_ARTBA.pdf (December 2015). Turner Construction, “Turner’s Second Quarter Building Cost Index Reflects Strong Market Conditions” (2017); Griffith, Harris, and Istrate, “Doing More with Less” (2016). Dallas County, Texas, County Code, § 70-153; Dallas County Fiscal Year 2017-2018 Budget, available at www.dallascounty.org/Assets/uploads/docs/budget/fy2018/FY2018_BudgetDetail.pdf (January 30, 2018). Dallas County Fiscal Year 2017-2018 Budget. Dallas County, Texas, County Code, § 70-153. The author would like to thank Mr. Jonathon Bazan (Dallas County, Texas), Mr. Kim Carpenter, Ph.D (San Juan County, N.M.), Mr. David Dise (Montgomery County, Md. ), Mr. Timothy Firestine (Montgomery County, Md.) and Mr. Darryl Martin (Dallas County, Texas) for providing essential information and comments for this report. Without them, this project would not have been possible. Within the National Association of Counties, the author would like to thank Emilia Istrate, Christina Iskandar, Jonathan Harris, Sanah Baig and Fred Wong for their helpful comments and contributions. Big thanks go out to Kelsey Wilson for checking the accuracy of the report and providing other helpful feedback. The author also expresses his appreciation to his Public Affairs colleagues for the graphic design and the website versions of the report and his Legislative Affairs colleagues for their input on the federal impacts on infrastructure. As a research manager, Andrew Hartsig will lead different research projects, especially those focused on county operations, structure and the future of counties. Andrew previously worked for the Loudoun County Department of Management and Budget and with the Arizona Association of Counties as a Policy and Research Analyst.